A few days before my wife, Sally, and I took off for Kenya, I walked into Barnes & Noble for a book to take along. I wasn't looking for anything necessarily pertinent to Kenya, nor even to Africa. the places and species we were seeing. All I wanted was a nice adventure story, something involving real people, Nature, survival against the odds (or at least redemption) and, of course, wonder. Scanning the twenty or so shelves of titles, I narrowed it down to three possibilities and then settled on a book about a woman whose parents settled in Africa in the 30s and who grew up and spent the rest of her life in intimate contact with animals. Barely noticing the title or author's name, I dove right in. 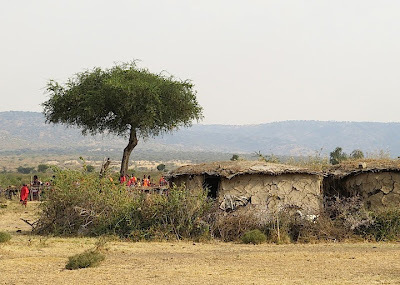 To my surprise and delight, the woman's story just happened to be set in Kenya, and, as we made our way around the southeastern quadrant of the country, turned out to parallel many of the places and species we were seeing. Flash forward to the last day of our incredible 13-day safari. We'd returned to Nairobi, where we had the afternoon off before heading to the airport for the first leg of our 21-hour flight home. Maria and John, the very nice young couple from New York City we'd been traveling with asked us to join them on a visit to a center for orphaned baby elephants and rhinos just outside of the city. 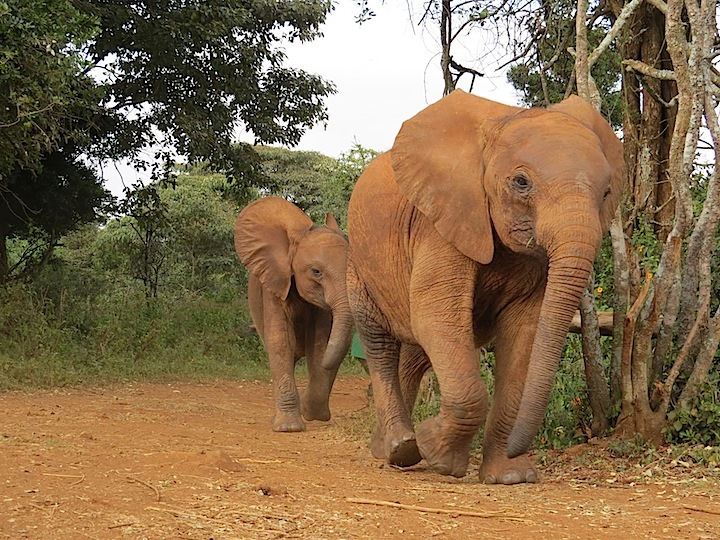 The Orphans Project of the David Sheldrick Wildlife Trust was an absolutely enchanting place. 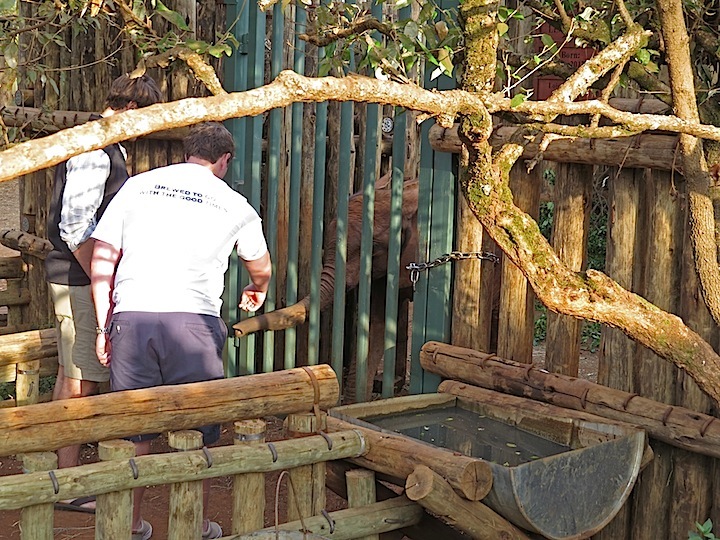 Our visit was timed to coincide with the daily round-up from the grounds and retirement to their pens of all 20 or so baby elephants currently in residence. In ones, twos and threes, they all came trotting dutifully around the bend and paraded right past us on their way "home" for the night. 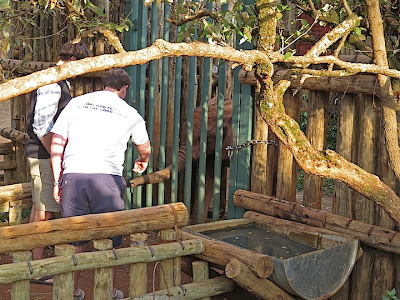 Once they were in their pens we were able to meet them up close, petting them, talking to them and, if we were lucky, getting to shake a soft, yet bristly, little trunk or two. for a town we'd driven through the week before. Sally "adopted" Narok, one of the babies named for a town we'd driven through the week before. And, while signing the paperwork, she happened to notice a book for sale in the shop, a book written by the Trust's founder, Dr. Dame Daphne Sheldrick—a signed copy, no less. Feeling sure I'd like it, she bought it for me. When Sally handed the book to me it dawned on her; "Isn't this the same book you're reading?" she said. I looked at the cover, and, though the design was quite different, the title, Love, Life and Elephants – An African Love Story, looked eerily familiar. And guess what. I now have two copies of an amazing, wonderful book, one with which I now feel a powerful personal connection. This little story exemplifies the wonderful, often truly magical, character of our experiences in Kenya. I invite you to stay tuned here, and on my travel blog, El Viajero Contento, for a serial account of the unforgettable people, places and natural wonders we encountered. I was there 2 years ago! It was a trip of a life time! One I will never forget! Many thanks, Victoria! So you know about what it's like seeing, in the wild, these animals you've only seen in books and on TV all your life. Pretty moving, right? 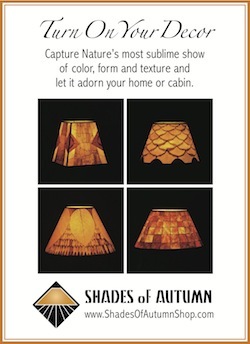 Fantastic post and supporting photographs! Mzuri sana! Mimi na penda tembo! I love elephants and I love Kenya....I want to to go that elephant preserve ..
Asante sana, Jan! Yes, Kenya is a pretty amazing country. Have you been there often? The elephant place is just in the outskirts of Nairobi as I recall. Well worth a visit, but I think you have to arrange it in advance.